Perform a quick and easy quantitative verification of Boyle's Law. 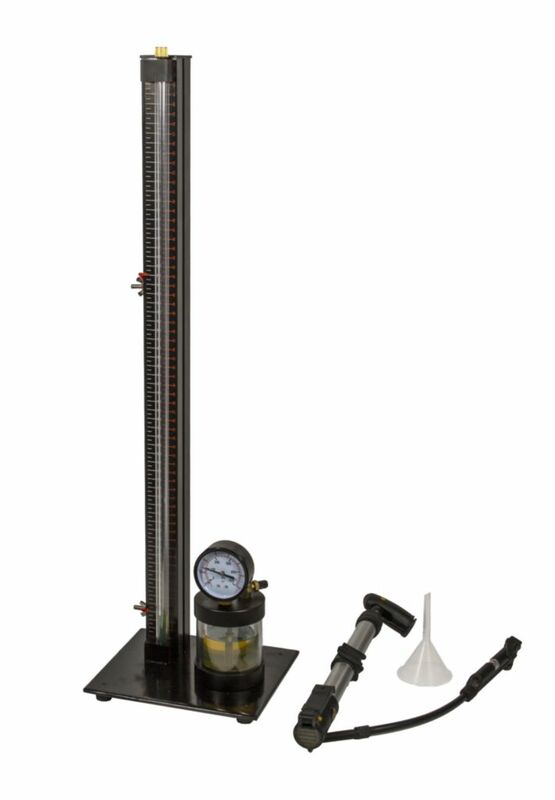 The air sample is enclosed in a thick-walled glass tube of constant bore, so that the length of the air column is strictly proportional to the gas volume. Hydraulic oil seals the air sample in the tube and partially fills a reservoir, so the pressure in the reservoir equals the pressure in the air sample. The pressure is measured by an absolute pressure dial gauge with a range of 0 to 500 kPa. Pressure is applied using a supplied high pressure bicycle pump, which allows precise fine control for making a large series of measurements or for using the volume proportions method. A needle valve allows for controlled pressure release and a vent knob is provided for the tube.